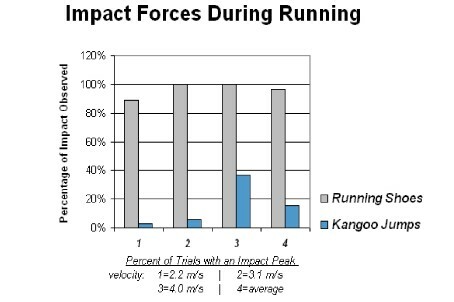 Consequently, Kangoo Jumps are the World's Lowest Impact Shoes. Their impact reduction also significantly enhances the healing process after sport injures or surgery, relieves pain, and provides the opportunity to exercise in a way that will also alleviate some of the symptoms of diseases such as arthritis, diabetes, etc. 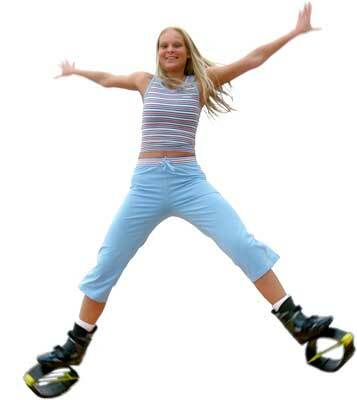 Kangoo Jumps is a blessing for those who have had to quit running/jogging because of stressed out joints. Studies show that while jogging in Kangoo Jumps your caloric burn and oxygen uptake is greater than when jogging in conventional running shoes. The studies show greater results when performing at a lesser pace than at a higher speed, which is excellent for individual who have not performed any type of cardiovascular in a while and are looking to get back into shape. And now a quote from N.A.S.A. Imagine a balloon filled with water and imagine moving that balloon up and down, every drop of water in that balloon moves, that is the same that happens inside your body when you are running, jogging, bouncing on Kangoo Jumps or a trampoline. Each cell of your body is like this balloon, every cell in your body moves and is regenerated. Rebounding puts them repeatedly under stress as they need to resist the increased G force (when the balloon reaches the maximum elongation). With time, the cell's membrane get thicker, thus firmer, and gains elasticity.